Catalonians' Civil Disobedience: A Lesson For Biafra And Nigeria? The Catalonians so much love and cherish their freedom that they had to disobey an injunction by a Spanish constitutional court which ruled against their referendum votes from taking place. The referendum which was later conducted on October 1, 2017 has dominated the mainstream media across the world, heating up the political atmosphere in Spain, whose government grossly misfired in handling the situation. Spanish prime minister, Mariano Rajoy who accused Catalonia's parliament of an “intolerable act of disobedience” vowed prior to the polls, to “stop at nothing” in ensuring that the Catalonia’s freedom referendum is thwarted completely. According to a report by UK Telegraph, Mr. Rajoy was quoted to have vowed that, “The consultation is not going to happen in any case,” declaring that his government is hell bent on “defending national sovereignty, the principle of legality and the institutions," and that they are "defending the rights of all citizens, above all of the Catalans.” A declaration so many analysts and Catalian sympathisers described as dictatorial, inflammatory and self-serving. However, the wishes of the Spanish prime minister did not see the light of the day, as the Catalonians would few weeks later, defy all odds to stage a historic referendum votes for the second time in less than 5years, despite numerous clamp down by Spanish security forces. Comparing the indomitable spirit of the Catalonians in Spain, to the daring spirit of Biafrans in Nigeria, one would simply say that the two independence seeking nations have a whole lot more in common when it comes to their audacity and resolve to achieve freedom. While Catalonians said no to Spanish constitutional court ruling, Biafrans are taking more audacious moves to have at least, a referendum. 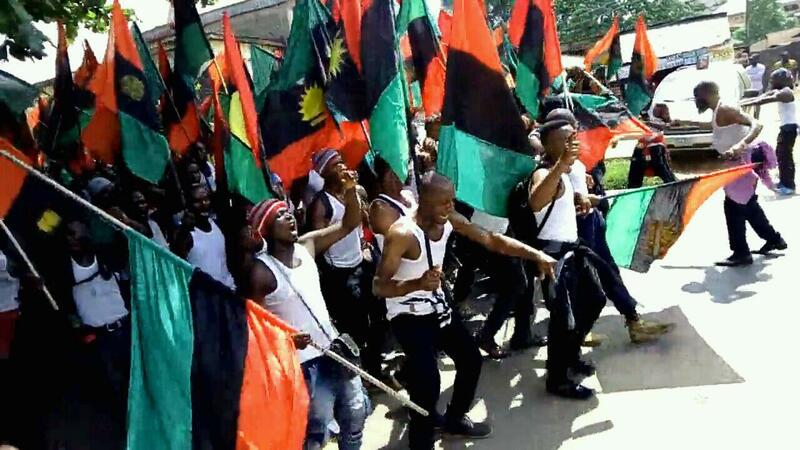 The Indigenous People Of Biafra, IPOB, led by the vibrant Jewish leader, Nnamdi Kanu (who has been missing or possibly killed after a bloody Nigeria military raid in his residence in Umuahia, Abia state) has called for a total boycott of subsequent elections in the region until referendum is allowed by the "oppressive" Nigeria government. But in a more brutal response than their Spanish counterpart, the Nigeria government led by a former military dictator, Muhammadu Buhari, feels that for demanding for a referendum, Biafrans are invariably calling for war, and therefore must be suppressed by every means possible. In less than one year, four military operations have already been carried out in both the coastal and hinterland regions of Biafra known as South-South and South-East respectively. One of these bloody exercises is responsible for the disappearance of the new Biafra leader, Nnamdi Kanu, whom many are fearing that he may have been assassinated on the course of a military raid that left scores of Biafran activists dead and several others injured in September. The incessant enforced disappearances, illegal detentions and extra judicial killings of activists is hugely feeding into sympathies towards IPOB both locally and internationally, with the body recording continuous tremendous growth in memberships and loyalties. While it is very much possible that IPOB's election boycott order will be successful in an upcoming gubernatorial election in Anambra state come November 18, the Nigeria government's predatory response to the independence sentiments in Biafra should be seen as a huge catalyst. It may have been too little, too late for Nigeria; but for Biafra, the whole world is watching, as she kicks off a giant stride to freedom.